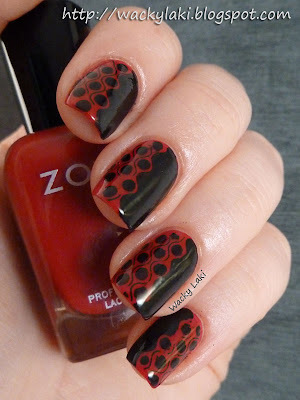 It is Sunday Stamping again in the group Adventures in Stamping and this week the challenge is "red and black," which was the perfect opportunity to try this manicure. I've tried it once before, but the stamp didn't turn out well so I never posted about it. I'm excited that this time it turned out much better and I can show it to you. Also, before I go on with the post, I want address a question I had last week. The stamping group where these challenges come from welcomes all stamping enthusiasts regardless of your skill level so please don't hesitate to join if you are interested! Looks great and really impressive! I love this! At first I loved the shiny version but really I love the matte so much more! That is fantastic! I don't know which one I like better, matte or glossy. Great job! The matte version is fantastic. Are like little lady bugs ( by the colors ). Thank you so much ladies! I'm thrilled that you like the manicure for the challenge. Thank you! I used Essie Matte About You as a top coat for the matte effect. Oh this is gorgeous! 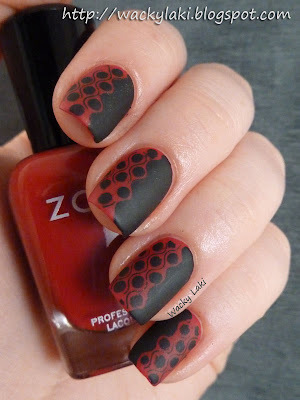 I even love the matte version-which I normally don't!